Syria Democratic Forces, with air support from the US-led coalition, have taken near complete control of Manbij, the group announced. Islamic State fighters had held the northern Syrian city near the Turkish border since 2014. The US-backed Syrian Democratic Forces (SDF), a coalition of Kurdish and Arab fighters, had fought since June to drive Islamic State (IS, formerly ISIS/ISIL) out of Manbij, a key city on the supply route behind the jihadist group stronghold of Raqqa and the Turkish border. The SDF is still doing the final sweep of the city after the final group of militants left on Friday. "The city is now fully under our control but we are undertaking sweeping operations," Sharfan Darwish of the SDF-allied Manbij Military Council told Reuters. During the withdrawal from the city, IS fighters took 2,000 civilians, including women and children, from the Al-Sirb neighborhood, Darwish told AFP. "They used these civilians as human shields as they withdrew to Jarabulus, thus preventing us from targeting them," he said. Jarabulus is a major IS-held city on the Syrian side of the border with Turkey. IS may have believed that the main effort by the US-backed troops would be aimed at Raqqa, as US Special Forces operators were photographed in the area in late May. Furthermore, Turkey had objected to the SDF advancing west of the Euphrates due to the large Kurdish presence within the coalition. 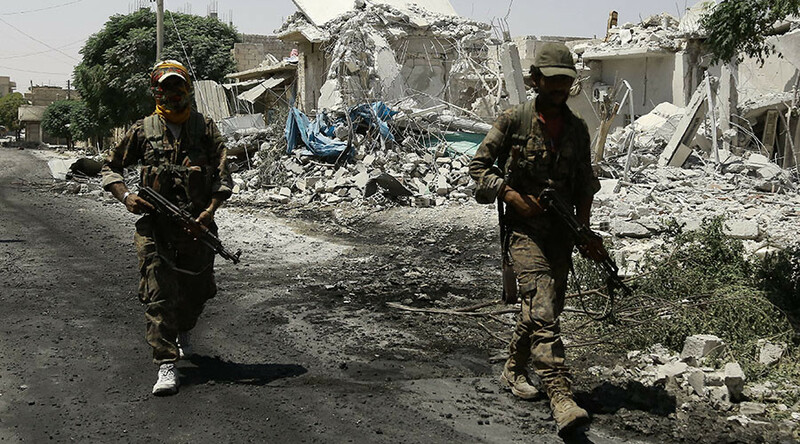 As a result, the US-backed militia made rapid advances and was able to encircle some 2,000 IS fighters in Manbij after only ten days of combat operations in early June. Taking the city proved a long and arduous effort, however, which Darwish explained by concern for the civilian population.